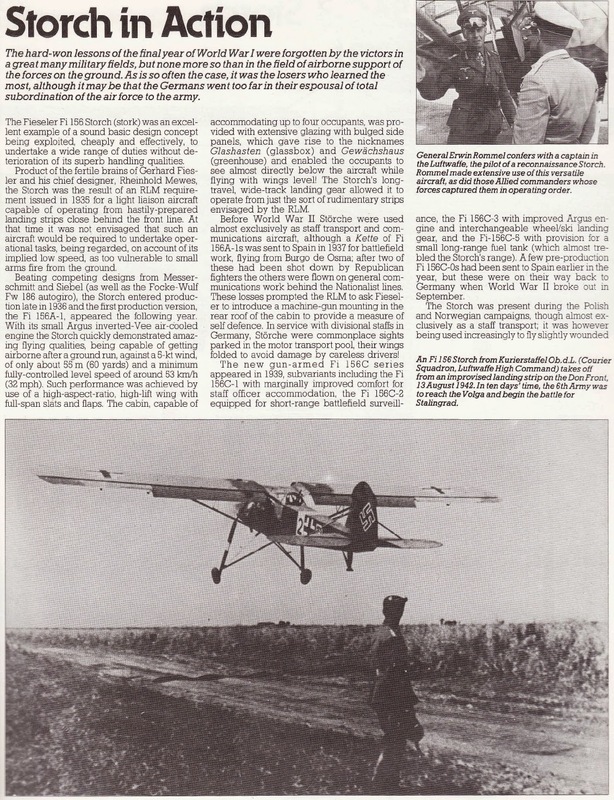 The ungainly Storch was one of the earliest STOL (short takeoff and landing) airplanes. It served in large numbers across Europe and Africa wherever the German army fought. 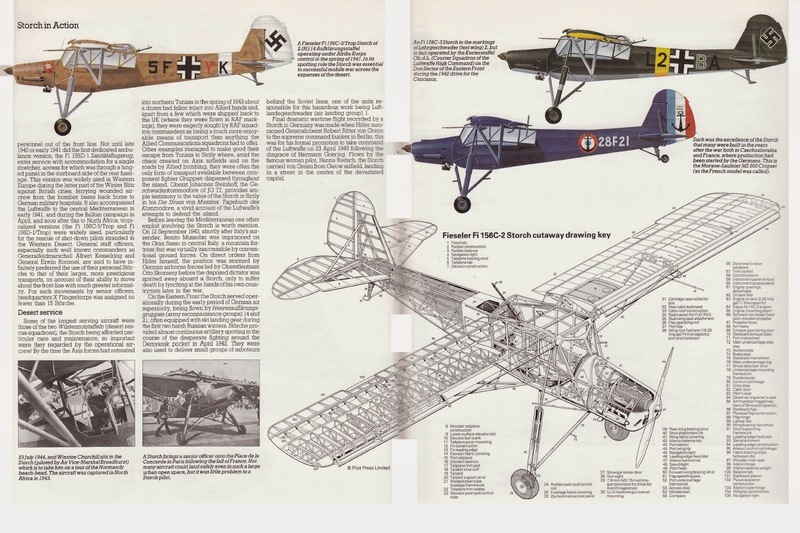 In 1935 the German Air Ministry announced competition for an army cooperation aircraft, one specifically designed to operate from very confined areas. A prototype entered by Fieseler beat out two airplanes and a helicopter to win the contest in 1936. The Fi 156 was a high-wing, cabin monoplane with exceptionally long undercarriage to kept the nose highly elevated. It was conventionally constructed of steel tube, wood, and fabric covering. The wing surfaces were also braced and the cabin extensively glazed to afford the crew of two excellent vision. 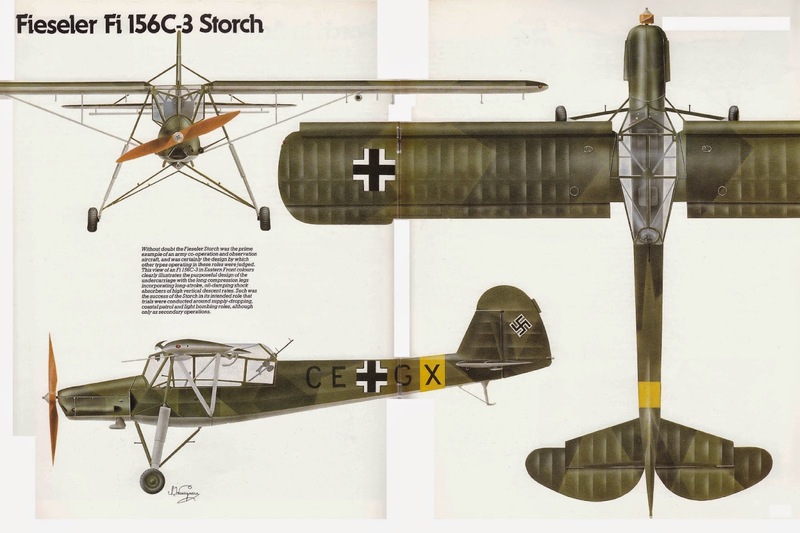 But the secret of the Storch (Stork) lay in the configuration of its main wing. The front portion sported full-span Handley Page wing slats while the trailing edge had slotted flaps and ailerons. Fully deployed, this arrangement allowed the diminutive craft to lift off in only 200 feet. Army officials were very impressed with the Fi 156 and in 1937 production commenced. By 1945 a total of 2,834 had been built. In service the Storch acquired a legendary reputation for its uncanny ability to operate where most aircraft could not. The slow-flying craft could even hover motionless while flying into a gentle headwind! This made it an ideal army cooperation craft, and hundreds were deployed with military units from the frozen fringes of the Arctic to the burning sands of North Africa. Storches were also widely employed to serve as medevac, liaison, reconnaissance, and staff transport. Moreover, Field Marshals Erwin Rommel and Albert Kesselring employed Fi 156s as personal transports throughout campaigns in North Africa and Italy. Perhaps its most notorious episode was in helping rescue Benito Mussolini from his mountainous prison in September 1943. Two years later, noted aviatrix Hanna Reitsch flew one of the Storch’s last missions by touching down in the ruins of Berlin with General Robert Ritter von Greim, newly appointed head of the nearly defunct Luftwaffe.